Chelan®: The Chelan variety is the leading early-ripening sweet cherry of the Pacific Northwest. They can ripen two weeks ahead of Bing. They are a firm cherry and have a round, heart-shape. Chelans are typically a little brighter than the Bing, but still have a nice mahogany color as a primary characteristic. Flavor/Texture: Sweet, rich flavor (16-18% fruit sugar)/Firm. TietonTM: Extraordinarily large in size, with excellent firmness and a mild sweet flavor. TietonTM is an early-season mahogany-red cherry, ripening one week before Bing. The impressive size, attractively glossy fruit, and thick green stems produce a visually stunning fruit for premium displays. Flavor/Texture: Mild (16-18% fruit sugar)/Firm. Bing: The leading and best known sweet cherry in North America. Bings are known for being firm, juicy, and having a deep mahogany-red color. Northwest Cherry growers have a unique ability to grow exceptionally large Bings and they experience world-wide demand every summer. Bing is the standard to which other varieties are compared. Flavor/Texture: Sweet, rich flavor (17-19% fruit sugar)/Firm. Lapins: A large, highly crack-resistant, mahogany red cherry. Lapins are grown throughout all the Pacific Northwest growing regions and are one of the top tonnage varieties. Recent advances in packing and storage techniques have helped make Lapins a popular cherry throughout the world. They grow exceptionally large and are great for displays. Flavor/Texture: Mild (17-19% fruit sugar)/Firm. SkeenaTM: Large, firm and sweet, SkeenaTM continues to grow in popularity with consumers and growers. Maturing about 16 days after Bing, this dark red to almost black variety has a very firm texture. A great late-season variety which is typically available until the end of July. Flavor/Texture: Sweet (19-20% fruit sugar)/Firm. SweetheartTM: A large, bright red cherry maturing one week to ten days after Lapins (3 weeks after Bing). SweetheartTM has a mild, sweet flavor and outstanding firmness. This heart-shape cherry ships extremely well, and you can enjoy SweetheartsTM well into August. Flavor/Texture: Mild (16-19% fruit sugar)/Firm. ReginaTM: Reginas are a large, dark red cherry. They have a firm texture and sweet flavor that is driving demand for this variety. Reginas are one of several newer varieties that have helped lengthen the Pacific Northwest season, giving more opportunities to enjoy great cherries. Flavor/Texture: Sweet: (16-19% fruit sugar)/Firm. Rainier: A very attractive, exceptionally large yellow cherry with a red blush. Rainier has a distinctive and superior appearance among sweet cherry varieties. Delicately flavored with extraordinary sugar levels, the flesh is pure yellow, very firm and finely textured. A premium niche variety that ripens after Bing and continues to grow in popularity. Color: Golden with pink-red blush/flesh- Clear colored. Flavor/Texture: Very sweet , delicate flavor (17-23% fruit sugar)/Firm. 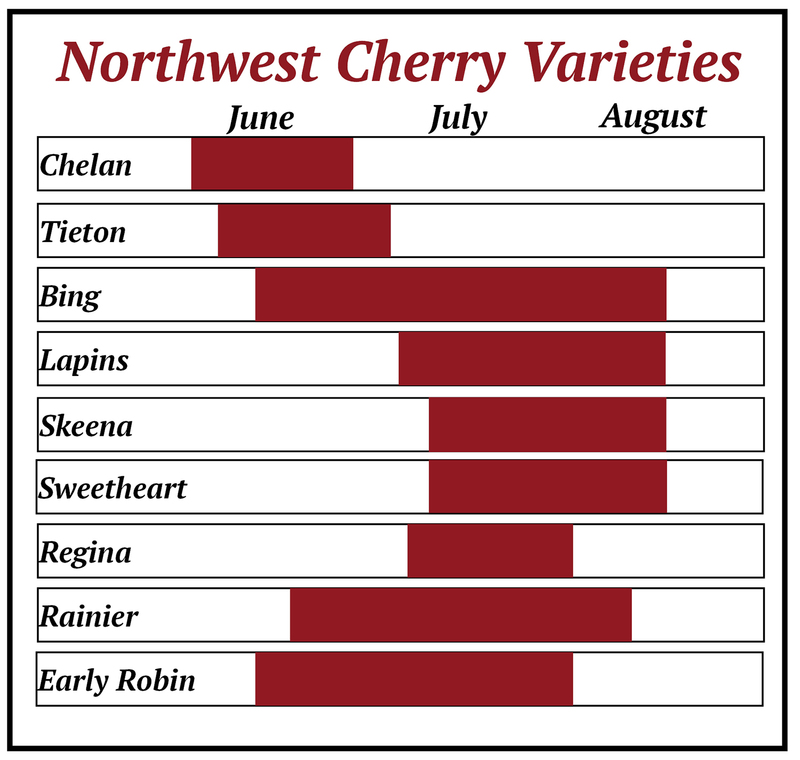 Early Robin: Quite similar to Rainiers, Early Robins ripen several days earlier, giving consumers nationwide the chance to enjoy a yellow fleshed cherry earlier in the season. Early Robins have the same golden color and red blush as a Rainier. Color: Golden with pink-red blush/Flesh- clear-colored. Flavor/Texture: Very sweet, delicate flavor (17-23% fruit sugar)/Firm.